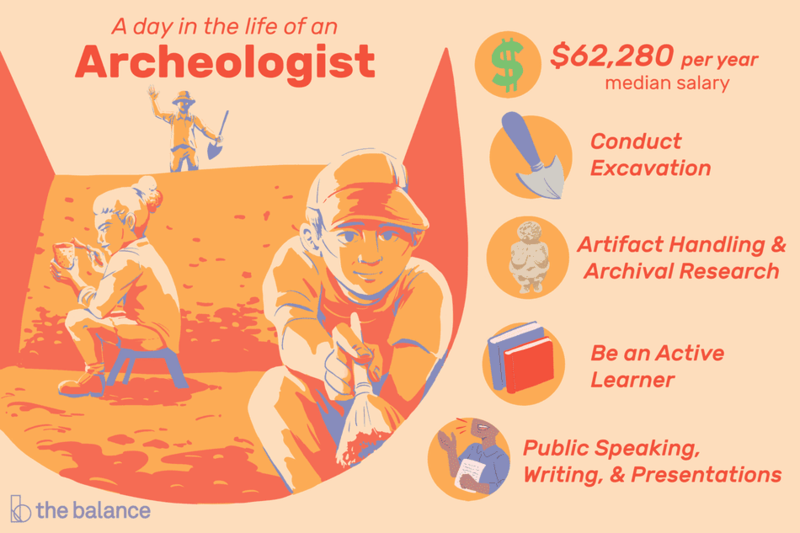 What Does an Archaeologist Do? Archaeologists use evidence left behind by earlier civilizations to gather information about human history and prehistory. They excavate, recover, and analyze artifacts that might include tools, cave paintings, building ruins, and pottery. Some archaeologists who work in cultural resource management ensure that construction work done on or near archaeological sites complies with historical preservation laws. Top employers include research organizations, consulting firms, government, museums, and cultural resource management firms. Fewer than 7,600 people worked in this field in 2016. The most highly compensated archaeologists work for the federal government. The U.S. Bureau of Labor Statistics combines employment data for archaeologists and anthropologists. This occupation can require some extensive education. Education: Going to graduate school to earn master's degree or doctorate in archaeology is almost essential. You'll need at least a master's degree for most jobs, but for some—particularly those that involve teaching at a college or university or require advanced technical or leadership skills—it's necessary to earn a doctorate. Training: Can you get a job with a bachelor's degree in archaeology? Yes, but the options are few. You might be able to find a job as a field or laboratory technician or research assistant, but only if you have work experience gained through an internship. Such experience can be very helpful, however, even after you've achieved an advanced degree. Archaeologists also need specific soft skills and personal qualities. Some are learned, but others are innate. Verbal communication and writing skills: Archaeologists must be able to communicate well, both in writing and orally because they must often present their work clearly and concisely to others. Active listening skills: Strong listening skills will help facilitate your communication with colleagues. Critical thinking skills: You must use reasoning to solve problems and make decisions. Reading comprehension: The ability to understand written material will help you with your research. Perseverance: This quality will serve you well since it will take extended periods of time to complete some projects. Active learning: Your desire to learn and incorporate new findings into your work will help further your research. Physical stamina: You'll be required to bend, kneel, stand, hike, and stand for extended periods of time, often while carrying field and personal gear. The job outlook for this profession is poor. The U.S. Bureau of Labor Statistics expects employment to grow more slowly than the average for all occupations, at about 4 percent, between 2016 and 2026, partially due to the fact that many of these positions can be reliant on research funding. However, archaeologists will still be needed to monitor and oversee construction projects. Fieldwork is a regular part of an archaeologist's job. You can expect to spend at least several weeks of each year traveling, and a significant portion of those hours outdoors. Some of an archaeologist's work can't be completed when weather is outright inclement, but heat and sun in some climates can nonetheless affect comfort. This is typically a full-time job. It can be confined to regular business hours, but this becomes less likely during times when an archaeologist works in the field. Fieldwork can involve weekends, early mornings, and late evenings.